These are probably the cuckoos that people hear the most because they occur in most suburban parts of Australia so long as there is suitable vegetation. 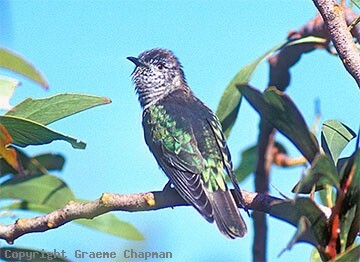 Shining Bronze-Cuckoos range throughout most types of forest country in eastern Australia and Tasmania, and also in the SW of Western Australia - they are generally more common in wetter coastal regions. They even occur in rainforest where they feed both up in the canopy and also down amongst shrubs and weeds around the edges. On a sunny spring morning, the iridescent green plumage of a Shining Bronze-Cuckoo sitting with its back to the sun is a sight to behold. Despite such brilliance, the bright green of their upperparts blends in well with the lush green growth they inhabit. Their strident, repeated "whistling-a-dog" calls (listen on sound page) are diagnostic. Often when birds are excited, particularly if several of them come together, they utter a rapid series of calls that descend in pitch, said by some to approach the sound of an Horsfield's Bronze-Cuckoo, but actually the timing is much faster and shorter in duration - a very different sound. Shining Bronze-Cuckoos are parasitic and lay their eggs in other birds' nests - more than 60 species act as hosts, but usually thornbills and gerygones; Yellow-rumped Thornbills are frequently chosen. 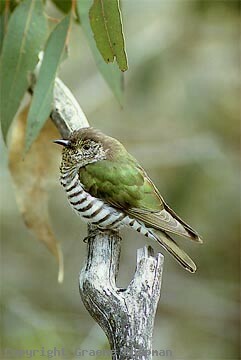 Shining Bronze-Cuckoos are migratory - those from the SW of W.A. winter in the Indonesian region - eastern Australian birds fly to New Guinea. 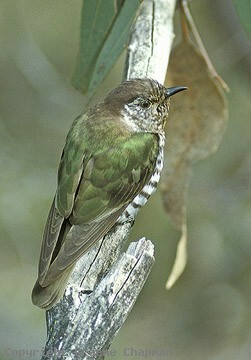 The subspecies 'plagosus', once known as "Golden Bronze-Cuckoo" is the principal one found in Australia. It has a maroon-bronze cap. New Zealand birds, subspecies 'lucidus' which have a green cap sometimes reach our east coast when on migration, but sightings are rare. 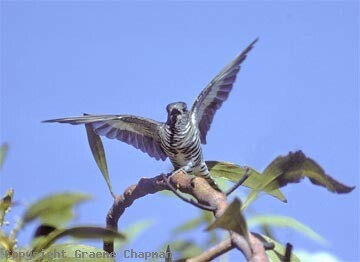 344002 ... Shining Bronze-Cuckoo, adult.